Description: Ever wonder whether God is inspiring you or if it’s just your imagination (or just a dream)? How do we know when to trust that inner voice and when to disregard it? 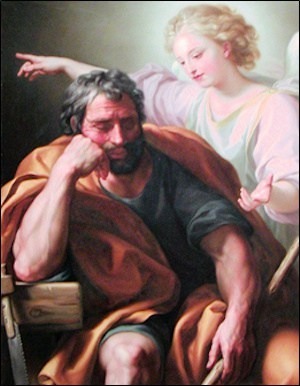 We can learn a lot from the faith of Saint Joseph. Gospel readings for the Feast of Saint Joseph, Husband of Mary, show us Joseph growing in his ability to trust God. How difficult it must have been to believe Mary’s story! So, since he didn’t trust her version of the story about her pregnancy, God sent him an angel in a dream. Now Joseph had to trust that his dream was not a product of his own imagination. Wouldn’t it have been more convincing if the angel had appeared to him in person, the way Mary was visited by an angel? Ideas for use: Bulletin insert the Sunday before March 19th or a hand-out for special parish celebrations of Saint Joseph and in RCIA class. All orders are shipped by digital download only. There are no hard copies available. The digital download will be printer-ready. Except for annual subscriptions, which are sent monthly to you by email, you will be able to download what you order immediately after payment, directly from our website. You will also receive an email with a download link. Our bulletin articles, called Good News Inspiration for Daily Life, are easy-to-read as take-home applications of the Catholic readings from Sunday Mass. For less than $3 a week for a Whole Parish License, you will receive by email PDF copies of the Bulletin Inserts, ready to print in black & white or color. Or order them as bulletin articles (text only) for just $1.50 a week.